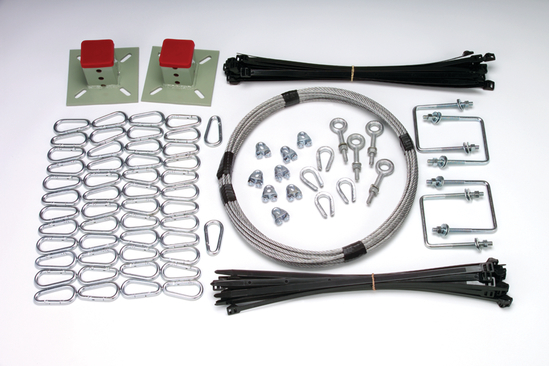 Flush mount add-on kit for rack guard net system - The first net panel in your run requires either a flush, offset or extension mount starter kit to attach the system to the rack, each additional net panel requires the appropriate add-on kit. Easily installed without special tools - Extremely fast and simple set-up with common tools found in most facilities for added ease of use. 60 ft. (18 m) of 1/4" (6.4 mm) wire cable - Provides a continuous anchor point which the net is connected to and offers fast and simple installation. 4 ea. 3/8" (9.5 mm) eyebolts - Provides easy to install anchor points to attach the cable system. 2 ea. Flush clamps - Attaches to the rack and provides the anchor point for your run of cable, the net system is attached to this for quick and easy installation. 4 ea. 1/4" (6.4 mm) thimbles - When combined with the cable clamps, these devices provide a simple means to terminate the cable lifeline. 8 ea. 1/4" (6.4 mm) cable clamps - When combined with the thimbles, these devices provide a simple means to terminate the cable lifeline. 50 ea. 5/16" (7.9 mm) snap hooks - Extremely fast way to attach the net along the entire run to the cable anchor system. 2 ea. Packages of nylon ties - Allows you to attach nets together to create longer runs for added flexibility. Flush, offset and extension mount hardware kits available - We have kits available for almost any configuration with everything needed to for fast, simple and safe installation. Custom configurations also available - Don't see what you need, contact us today and request a quote for your custom rack guard system.